The State Department of Health makes available for public use microfiche copies of older indexes to birth, marriage, and death certificates. The indexes cover the entire state outside of New York City and start in June 1880 (deaths) or 1881 (marriages and births). Birth indexes are made available after 75 years, marriage and death indexes after 50 years. Birth indexes have been made available through 1937 only. An index entry states only the name of the person, date and place of event, and State certificate number. Indexes for certain years are arranged by SOUNDEX codes. The data in the indexes is not available in electronic format, except for death indexes made available for download from the State Department of Health. These datasets start in 1957 and are posted after 50 years. Data elements include year/date of death, decedent name, gender, residence code, and state file number. The State Archives also holds an index to “delayed” birth certificates filed for some births occurring prior to 1881 [series B2029], mostly in the 1870s. The DOH indexes do not include vital events in New York City and in the former city of Brooklyn for any period. Indexes to New York City vital records are available through the Vitalsearch Company (for a fee), and for free on the websites of the Italian Genealogical Group and the German Genealogy Group. The indexes do include vital events in the former towns of Kings County prior to their annexation by the City of Brooklyn in the 1880s and '90s; in portions of Westchester County prior to their annexation by New York City in 1895; and in Richmond County (Staten Island) and the western portion of Queens County prior to their incorporation into the City of New York, January 1, 1898. The birth indexes do not include original data for adopted infants. The birth and death indexes do include data on individuals who were born or died in a state facility (such as a prison or mental hospital). Albany. New York State Archives, Cultural Education Center, Empire State Plaza, Albany 12230. No appointment is needed to use the indexes. Researchers must produce identification, sign a registration form, and comply with the rules of the research room. Several microfiche readers are available for use; however, researchers will be limited to one hour's use of a microfiche reader, if other persons are waiting to use the readers. Binghamton. Broome County Public Library—185 Court Street, Binghamton, NY 13901; telephone (607) 778-6400. Buffalo. Buffalo & Erie County Public Library, Grosvenor Room, 1 Lafayette Square, Buffalo, NY 14203; telephone (716) 858-8900. Elmira. Steele Memorial Library—101 East Church Street, Elmira, NY 14901; telephone (607) 733-8603. Glens Falls. Crandall Public Library, Center for Folklife, History & Cultural Programs—251 Glen Street, Glens Falls, NY 12801; telephone (518) 792-6508. New York City. National Archives at New York City, One Bowling Green, New York, NY 10004; telephone (212) 401-1620, email newyork.archives@nara.gov. Patchogue. Patchogue-Medford Library—54 E. Main Street, Patchogue, NY 11772; telephone (631) 654-4700. Rochester. Rochester Public Library--115 South Avenue, Rochester, NY 14604; telephone (585) 428-8440. Syracuse. Onondaga County Public Library, 447 South Salina Street, Syracuse, NY 13202; telephone (315) 435-1900. Utica. Utica Public Library—303 Genesee Street, Utica, NY 13501; telephone (315) 735-2279. Watertown. Flower Memorial Library—229 Washington Street, Watertown, NY 13601; telephone (315) 785-7705. Transcription, reproduction, loan, or sale of the indexes is not permitted. The data in the indexes is not available in electronic format for on-line access, with the few exceptions mentioned above. 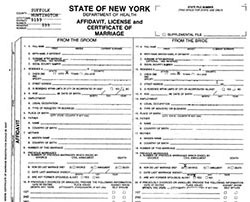 The New York State Archives does not hold birth, marriage, and death certificates, only indexes to them. The State Department of Health and local registrars of vital statistics are authorized to furnish uncertified copies of vital records for genealogical purposes. Data on living persons is restricted by law. Contact DOH or a local registrar for application forms and general information. *Includes records for western Bronx, 1874-97, and eastern Bronx, 1895-97. *Pre-1898 records are for Brooklyn city only. Records for former towns in Kings County usually commence 1880-81; some of those towns have vital records for the later 1840s. *There are scattered earlier records for towns and villages prior to their incorporation into New York City in 1898. Long Island City records start in 1871. Some upstate cities began recording some vital events a few years prior to 1880: Albany, Binghamton, Buffalo, Elmira, Newburgh, Poughkeepsie, Rochester, Syracuse, Utica, and Yonkers. For further information contact the city clerk's office. Some county clerks hold marriage records for the period ca. 1908-35. U.S. Department of Health and Human Services. Social Security Administration. Social Security Death Index. [Index to claims for Social Security death benefits; available online at http://www.ancestry.com/search/rectype/vital/ssdi/main.htm. U.S. Work Projects Administration. Historical Records Survey. Guide to Public Vital Statistics Records in New York State (Including New York City), 3 vols. Albany: 1942. Guide to Vital Statistics in the City of New York . . . Churches, 5 vols. New York: 1942. Guide to Vital Statistics Records of Churches in New York State (Exclusive of New York City), 2 vols. Albany: 1942. Prior to 1784 couples intending to marry were required to obtain licenses from and file bonds with the provincial secretary, if the impending marriage was not announced in a church. These Marriage Bonds (A1893) were mostly destroyed in the 1911 State Capitol fire. Published abstracts are available in Names of Persons for Whom Marriage Licenses Were Issued by the Secretary of the Province of New York, Previous to 1784 (Albany: 1860; repr. with supplements 1984); and in New York Marriage Bonds, 1753-1783, comp. Kenneth Scott (New York: 1972). Contact us for further information on holdings and services of the New York State Archives.